NO OTHER PERSONALITY in 19th century American Christianity seems to represent so clearly or so dramatically the spirit of raw frontier democracy as Charles Grandison Finney. He appears to us in books and memoirs as the pre-eminent apostle of hell-fire revivalism, fearlessly unscrupulous about his methods of getting conversions, a sort of Andrew Jackson in the pulpit, preaching a gospel written on buckskin. “They used to complain that I let down the dignity of the pulpit,” Finney snorted contemptuously in his Memoirs, and compared with the staid dignity of a New England parson, that is precisely and deliberately what he did. Manners were not the only way in which Finney looked like a bizarre departure form the hide-bound world of Yankee divines in wigs and shoebuckles. Finney liked to admire himself as a self-made theological man, and remarked that at the beginning of his career as a preacher he “had read nothing on the subject except my Bible.” And like most American religious innovators, he produced and served up ideas that sent a shiver down the spine of many a frock-coated seminary professor. Although ordained by the Presbyterians, he ignored the high Calvinism of the Westminster Confession of Faith and declared that every “sinner, under the influence of the Spirit of God, is just as free as a jury under the arguments of an advocate.” He dismissed original sin as a doctrine unworthy of God. He threw overboard the conventional understanding of Christ’s atonement (in which the life and death of Jesus are imputed to the elect) in favor of a governmental theory of the atonement, which merely held that Jesus’ death made it allowable for God to forgive sinners if they made themselves righteous by faith. Later in his career, when he had become a professor and college president himself, he taught the ability of Christians to achieve moral perfection and freedom from sin in their lives. Finney, in fact, seems so much a departure from everything which had gone before him in American theology that many of his later biographers were content to take him at his word, and explain him as some sort of new, unprecedented phenomenon on the American scene, in a class with the Erie Canal and the McCormick reaper. He has been called an Arminian, even a Pelagian. But was he? 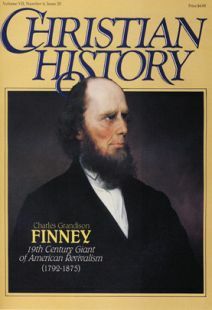 Although at first glance, nothing would seem to be further from the straight-laced, upright Calvinism of the Puritans than Charles Grandison Finney, the truth is that nothing in Finney’s career makes any sense apart from his background in New England Calvinism, and especially in Jonathan Edwards (1703–1758). And the doctrines that made so many of Finney’s hearers blanch were actually nothing more than his own extension of a century-long Calvinistic tradition in New England. The first thing we have to understand here is the significance for Finney of Jonathan Edwards and his legacy. Although Edwards is best known as something of a brimstone peddler himself, his overall interests were infinitely broader and philosophical. Taken together, Edward’s philosophical and ethical writings represent the most ambitious attempt ever to justify Calvinism in the midst of the moral and intellectual Enlightenment of the 1700s. The critics of Christianity in the 18th century complained that the God of the Bible was an arbitrary, lawless autocrat; Edwards replied that God was a perfectly “Moral Governor.” And to prove it, Edwards often espoused governmental notions of Christ’s atonement in order to show that God never violated his own sense of law and order, never forgave sinners unless they actually deserved it, and never transferred (or imputed) Jesus’ righteousness to anyone else. This called forth a pretty severe code of ethics, but Edwards was a severe man, and most severe of all with himself. The problem this posed in theological terms was how a Calvinist like Edwards could logically expect sinful men, tainted by original sin inherited from Adam, ever to earn God’s approval. To that Edwards made two replies. First, in 1754, he published a lengthy inquiry into the Freedom of the Will, and came up with an elaborate philosophical formula which stated that no one actually had the moral ability to repent and turn to Christ on their own; however, everyone had a natural ability to repent (in other words, they could stop sinning, but they wouldn’tstop sinning; they could make the number of their sins one less if they were indeed so inclined). Sin was strictly a moral quality, and it did nothing to excuse or prevent anyone from exercising his natural ability and obligation to turn to God. Edward’s second reply came in 1758, in a book on Original Sin published just after his death. There, Edwards suggested that original sin was not some mysterious quality that infected the human system and disabled anyone from repentance. He instead described it as an identification with Adam by which God regards all human beings as an organic unit with Adam for the purpose of judgement. Edward’s ideas found a steadily growing audience, but the most prominent of his followers were his theological pupils Samuel Hopkins of Massachusetts, and Joseph Bellamy of Connecticut. Hopkins and Bellamy helped to structure Edward’s teachings into what became known as the New Divinity, and by 1800, the New Divinity had established itself as a force to be reckoned with in New England and elsewhere. This brand of New England Calvinism still retained all the usual teachings of predestination, election, and the sovereignty of God. But, like Edwards, they preached the full natural obligation of the sinner to repent; they redefined original sin as simply God’s constitution of the human race, and they demanded a moral rigor from their converts which would make them proper objects for a governmental atonement. In other words, they taught that, though God was the sole giver of salvation, all people were under obligation, out of natural ability, to live as though they deserved it. And they demanded that it be done immediately; no sinner who had a full natural ability to repent ought to be let off the hook for a moment. Nathanael Emmons, one of the most colorful and terrifying of the New Divinity men, warned that sinners “have no excuse for neglecting to do their first work till a more convenient season. God now commands everyone who is in a state of nature to put away his native depravity and immediately comply with the terms of mercy which he has proposed in the gospel.” Under preaching of such severe emotional intensity, it is no wonder that the New Divinity men became the hottest revival preachers of their day. The New Divinity frightened most conventional Calvinists out of their wits. Many Congregational Calvinists in New England, and many more Presbyterian Calvinists in the Middle Atlantic states, looked upon the New Divinity as an apostasy from orthodox teaching and a threat to their own stability. Princeton Theological Seminary was founded, in large measure, by Presbyterians eager to protect their denomination from influence by the New Divinity. But a collision between the two Calvinisms was unavoidable, and many of the early skirmishes between them were fought in upstate New York, where New Divinity preachers from New England and Presbyterian parsons from Princeton met and tangled in the flood of western emigration in the early 1800s. It is just at this point—in upstate New York—that we meet Charles Finney. Understanding the dimensions of Edwards, and especially his New Divinity pupils, throws Finney’s famous Memoirs into an entirely new light. For one thing, though Charles moved to New York as a child, he was a New Englander, born in Warren, Connecticut in 1792, smack in the middle of the New Divinity’s heartland. And in 1812 he returned to Connecticut and spent time there working on his uncle’s farm. In 1823, he was put under the care of a Princeton graduate, George W. Gale, and as soon as the two sat down to talk theology, some very un-Princetonian ideas popped out of Finney’s mouth. Gale “was a Princeton student, and of course held . . . that Jesus suffered for the elect the literal penalty of the Divine law,” Finney recalled. “I objected that this was absurd . . . on the contrary it seemed to me that Jesus only satisfied public justice, and that was all the government of God could require.” That, of course, meant a governmental atonement—and endless nights arguing theology with Reverend Gale. For the next 20 years, Finney continued to pour out a string of Edwardseanisms. He demanded the immediate use of natural ability from sinners. “Instead of telling sinners to use the means of grace and pray for a new heart,” Finney wrote in his Autobiography, “we called on them to make themselves a new heart and a new spirit, and pressed the duty of instant surrender to God.” He scorned any notion of original sin which implied it could excuse a sinner from repenting. “To represent the [human] constitution as sinful is to represent God, who is the author of that constitution, as the author of sin.” And he unabashedly upped the ante of Edward’s moral rigorism to a demand for moral perfection. “Nothing short of present entire conformity to the divine law is accepted of God,” Finney wrote. In none of this was Finney conscious of promoting anything remotely “Arminian” or “Pelagian.” To the contrary, he considered himself a disciple of Edwards. This judgement applies even to Finney’s most heavily criticized innovation, the so-called anxious bench. Invited to preach in Rochester, New York, Finney “felt the necessity of some measure that would bring sinners to a stand . . . to make the impression on them that they were expected at once to give up their hearts”—or, in New Divinity terms, to make them exercise their natural ability to repent. He hit first upon the idea of making those who had been moved by his preaching simply to stand up; but then he decided to have them “come forward to certain seats which I requested to be vacated and offer themselves up to God, while we made them objects of prayer.” By these means, the sinner was shown that he had all the ability anyone would ever have to respond to God, and that there was no more to hinder him in coming to Christ than there was coming to the anxious bench. It is noteworty that the minutes of the celebrated New Lebanon Conference reveal no criticisms of Finney for “apostatizing” from Calvinism; instead, he was rapped ever so gently on the knuckles for poor taste in his preaching. He went back to his evangelizing, little repentant even for that, without any suggestion that he was standing outside the New Divinity way of thinking. The hold that Edwards and the New Divinity had on the young revivalist’s mind changed and blurred over the years that followed, as Finney met newer challenges and continued to invent newer measures (such as having women pray in public). Nathaniel William Taylor, whose “New Haven Theology” represents a significant attempt to wrench Edwards in some decidedly un-Edwardsean directions, had an unmistakable and not always helpful impact on Finney. But the overall shape of his thought retained its general Edwardsean outlines to the end. In his most extended piece of theological writing, the Systematic Theology he composed at Oberlin College, Finney still clung to many of Edward’s definitions of human psychology. Along with Edwards, he resisted the predominant swing toward utilitarian ethics in 19th-century American philosophy, and even attacked slavery in the 1850s on the same grounds that Hopkins and Bellamy had attacked it after the American Revolution. What Finney taught and preached was not Arminianism at all, but the peculiarly New England brand of Calvinism associated with Edwards and his followers; and if we have mistaken Finney for an Arminian, it is probably because we have assumed that old Princeton represented the only available brand of Calvinism, and that anything else must, by exclusion, be Arminian. Reverend Dr. Allen C. Gueizo is professor of church history and Academic Dean att the seminary of the Reformed Episcopal Church in Philadelphia, Pennsylvania. His new book Edwards on the Will: A Century of American Theological Debate is published by Wesleyan University Press.